I come away with a few things when I see Oblivion: Joseph Kosinski has a good eye for design as he’s shown in Tron Legacy. And Tom Cruise can save the world until he 70 and people will still believe it. It’s not this year’s Matrix but it’s fun all the same. 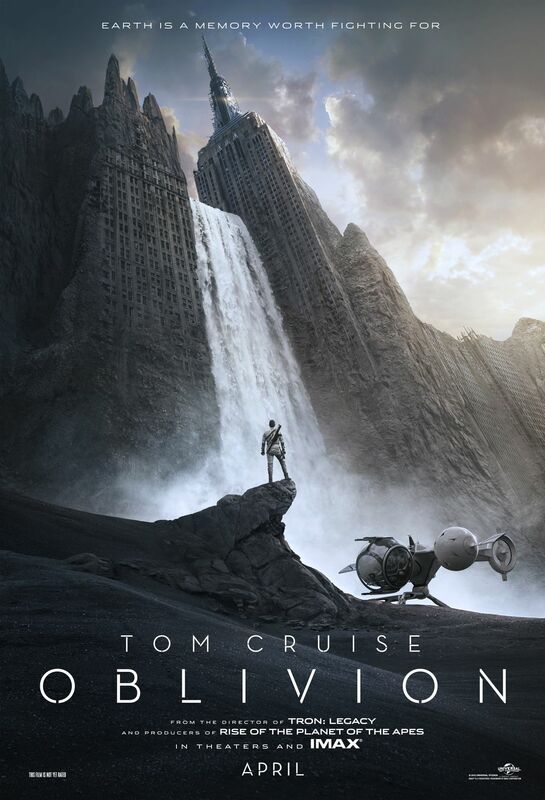 Directed by the aforementioned Joseph Kosinski, stars Tom Cruise as Jack Harper as drone maintenance tech assaigned during a clean up of Earth after a devastating war with an enemy. The Earth itself is crust of it’s former self due to the enemy nuking the moon. Now some several years later, Jack and his communication’s partner Victoria played by Andrea Riseborough live in white sterile tower above it all. Until one day Jack investigates a signal against orders from command and comes face to face with the woman that has been haunting his dreams, Julia played by Olga Kurylenko. The empire building starts off well because Harper tells us everything we need to know instead of showing us. Harper and Victoria’s daily routine is established early enough from Jack’s mysterious dreams of Julia to his fixing the drones to wandering off grid to a cabin he has been filling with chockeys over the years. Two weeks and they join the rest of humanity in Titan. Andrea’s Victoria is Jack’s lover and lifeline with the Tet. Tet is a giant space station above the Earth. It makes sure the Earth’s remaining resources are collected properly. She is given enough backstory to show that while Jack is restless, Victoria is willing ignore things that have piqued his interest. The introduction of Julia throws a wrench into the works for the seemingly loving couple. The friction gives Victoria something to do while Julia’s character re-acts more than acts. Jack follows Julia down the rabbit hole and encounters Morgan Freeman’s Beech character and his army of well dressed scavengers with nicely designed masks. He plays magic helper well enough to have Jack question everything that has happened so far and shows him the door to discover it for himself. Through a series of well timed events both Jack and Julia find several pieces of a bigger puzzle. It’s in beginning of the last act when two reveals are dropped into our laps that the plot feels rushed. The first reveal is told to the audience Beech explains it all. No. Really. He. Explains. It. All. Unfortunately he is the magic helper and the magic helper info dumps. This is always bad because you want the audience to experience the movie not to be told. The second reveal would have been better at the beginning of the movie without Tom Cruise’s character voice over before the credits. Remember the shark attack in Jaws? Well, Oblivion’s shark attack happens in the wrong act and would have set things up nicely but alas no. From a writer’s perspective this movie is filled with the classic science fiction tropes: aliens invading Earth, humans fighting back only to succeed but devastate the planet followed by advanced technology in a ruined world, first contact and several iconic american tourist attractions destroyed or ruined. The Empire State Building being used is a great idea since the antenna atop the ESB is so alien to begin with. It also comes with cliches such as the star crossed lovers finding themselves, the amnesiac hero, the forbidden zone where no one is supposed to go, blowing up the enemy HQ stops all the troops and human spirit cannot be chained. Looking past the cliche’s and the voice over opening (which is just as bad as rolling credits, imho) seeing it in IMAX and without the 3D was a great experience. The sound, cinematography and design are all there. The music is not as hummable as Daft Punk’s Tron Legacy and just feels like it’s there to boom when need be. This entry was posted in Movies, Reviews and tagged movie reviews, oblivion by RK Bentley. Bookmark the permalink.